A Physician Advertising on Twitter is Exposed. The Sordid Details. Here I sit, drenched in flop sweat. @drrwinters you're paying to have your posts promoted?!?! It is true. I—a physician—promoted some tweets on Twitter. And more important: Am I any different than those drug reps I block from my department and whom others hide under tables to ignore? Read on, brave reader, I will reveal the sordid details. A few months ago, I wrote a blog about the disruption of health care. I posted it in our hospital’s medical staff newsletter and received positive feedback. I felt good about this post and had spent a good amount of time writing and editing it. I wanted to share it. I wanted to hear what other people thought. My blog site, RichardWinters.com, at that time was getting about 20 visits each day (I have a big family). So I decided that I would submit the blog as a guest post to a high traffic medical blog. I was turned down by one blog with a polite form letter, and the other said that it was a great post (and could I also write about my experience as an executive coach for physician leaders). Then they forgot me, and it was not published. So I published the blog on my own site. 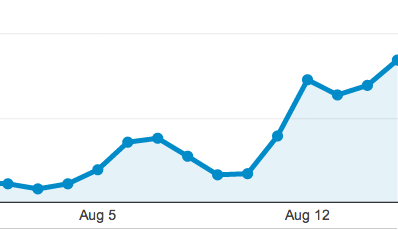 It was retweeted by 3 people and favorited by 1 with a daily traffic spike on my blog of 40 visitors. Am I writing a diary or am I writing about ideas that I want to share? No, I am not writing a diary. That would be far more interesting and have at least as many retweets. How do I reach those who don’t follow me? (other than writing daily for years and slowly building an audience) I like my Twitter friends, but we are sort of an open but remote community of emergency physicians. I’d like to reach more physicians in specialties outside our own. What if I promoted the post on Twitter? If nobody responded, the message would be clear: Either I stink as a writer (only good writers get retweets and followers—a known twitter #fact) or promoting a tweet is just so dang narcissistically creepy that it’s more repulsive than following Jenny MacCarthy (not to be confused with Jenny McCarthy). I also gained 111 followers. What were the criteria for the sponsored tweet? I picked up a couple more coaching clients. They are physician leaders in senior health care positions. I was contacted by a professor at the University where I got my MBA. I had some nice conversations with new Twitter friends. I have an opportunity to learn from bigger group of Twitter friends. I have a deeper understanding of one more small facet of social media. Will I advertise on Twitter again? Social media provides physicians an opportunity to learn, teach, and lead health care. It provides an opportunity to connect for greater impact. I want to understand it deeply and also help others understand it. are honest about what is beyond the clicked link. link to the same content that I already blog (i.e. social rss). are educational (and perhaps a bit entertaining). Will I advertise this blog post with a promoted tweet? I will promote it as two different tweets. A randomized A/B experiment to see how different titles affect engagement rates.